A top view of homeless beggar man lying on the ground outdoors in city in a sleeping bag, asking for money donation. 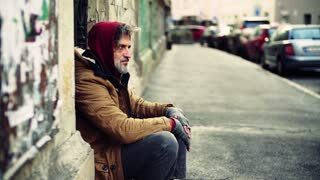 A homeless beggar man sitting in front of gate outdoors in city asking for money donation. Slow motion. 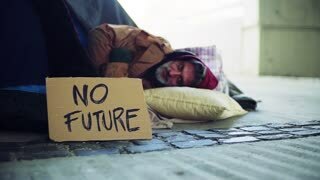 Homeless beggar man lying outdoors in city in a sleeping bag, no future cardboard sign near him. 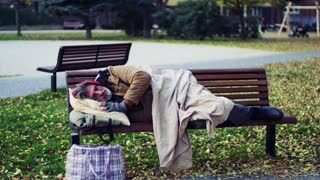 A homeless beggar man with a pillow lying on bench outdoors in city, sleeping. 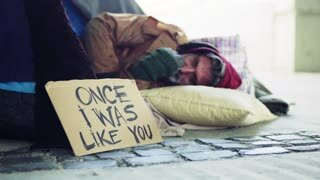 Homeless beggar man lying outdoors in city in a sleeping bag, cardboard sign near him. A portrait of homeless dirty beggar man lying outdoors. 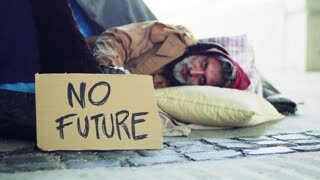 Homeless beggar man lying outdoors in city in a sleeping bag, no future cardboard sign near him. Slow motion.